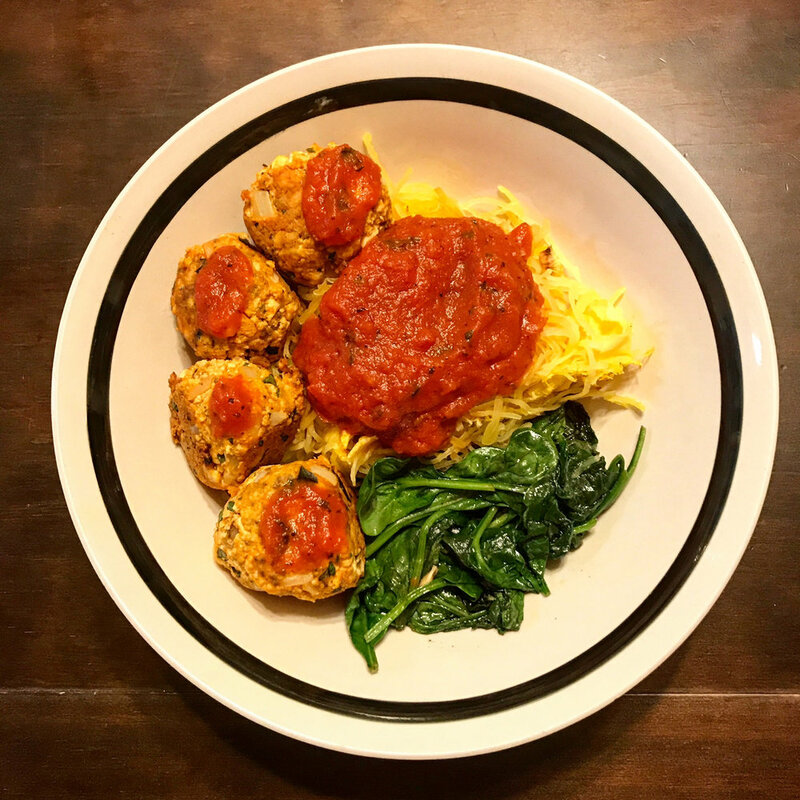 Your classic spaghetti and meat balls- yes there is a plant-based version of this! I think the tofu "meatballs" are even better then actual meatballs, but that's just me ;) Rather then using normal spaghetti noodles which are simple carbs, meaning they offer no nutritional value and contain no fiber so they are digested quicker causing your blood sugar levels to spike. I decided to go with spaghetti squash which offers a high amount of fiber, vitamins C & A, potassium and calcium. Treat yo self with nourishing whole foods and I promise in the long run you are getting more bang for your buck! 2. Cut your spaghetti squash into round rings, spoon out the guts and seeds and lay them on a sheet pan. 3. Bake for 40 minutes in the oven and then let cool. 5. Press all the water out of the tofu using your hands or a heavy bowl. 6. Break up the tofu into crumbles and combine with the rest of the ingredients in a mixing bowl. 7. Form into little balls. Heat a pan with olive oil over medium heat and place the balls in the pan, cover with a lid. Continuously flip over until all sides are golden brown. (They can be on the delicate side, so be careful when flipping them). 8. Once you have cooked your tofu balls, heat the tomato sauce in a pot over medium heat. While doing this you can cook your spinach. Oil a pan with olive oil over medium heat and add a few large handfuls of spinach and juice from one lemon. Cover with a lid until the spinach is cooked evenly. 9. Put it all together and eat up!